Combine the rum and the raisins the night before. Cover and let soak. Beat the sugar and egg yolks together until thick and pale yellow. Bring the milk to a simmer. Pour the mixture back into pan and place over low heat. Stir until the custard thickens (around 60C). Allow the custard to cool to refrigeration temperature. Mix in the cream, beating for one minute. Freeze using a domestic ice cream machine, or cover and place in the freezer. 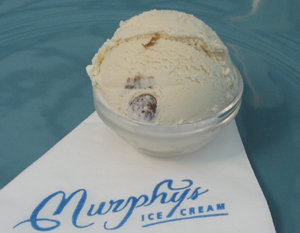 Add the rum and the raisins once the ice cream has become reasonable solid, then continue freezing until ready. Notes: 1. 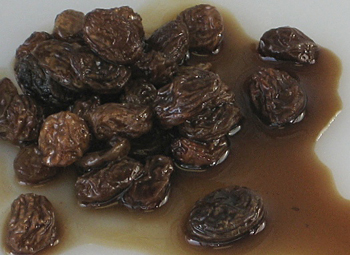 It is important to soak the raisins in the rum. Otherwise, the raisins will become icy in the ice cream. 3. To pasteurise the eggs, heat the custard to 73C and keep at that temperature for three minutes. Use a cooking thermometer, though, and keep stirring! If the custard goes any higher than 76C, the eggs will scramble. Immediately cover and place in the freezer until cool. oeh, this sounds so yummy! Hi, a huge fan of your blog from U.S.A. Have a quick question — the recipe said you can just freeze the mixture in the fridge. How well does that work? I don’t have an ice cream machine and would LOVE to try some of these recipes… and if so, what kind of container? Thanks for that Stella. You can put the ice cream mix in the freezer and wait for it to turn solid. The only thing is that it turns out really dense that way. It’s best to stir it several times during the freezing process, every few hours or so to break up the ice crystals… Of course, recipes with alcohol in them will have better consistency, so maybe rum raisin is a good place to start. Good luck! I have made this 3 times now and it always gets rave reviews. It is the best recipe I have ever tried and it is truly a special treat. I am making it again for my brothers birthday. Thanks for sharing. Love the recipe, tastes delicious and just like your own product in the shops. Just wondering what exactly one cup size is? I only have mugs in the house, I found a conversion chart that said it was half a pint, is this correct? Do the ice cream recipes work if you subsitute soy milk instead of milk (leaving the cream in)? I just stubbled upon your recipe for rum and raisin ice cream. 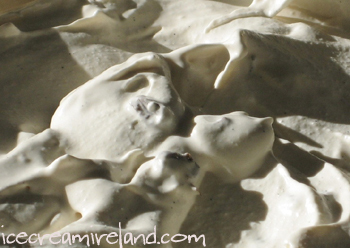 I have a simple vanilla ice cream just finishing in the maker, a chocolate ice cream mix cooling in the fridge and I was thinking it might be fun to make a rum and raisin ice cream. I will start the raisins to soak now and look forward to enjoying some of this tomorrow.